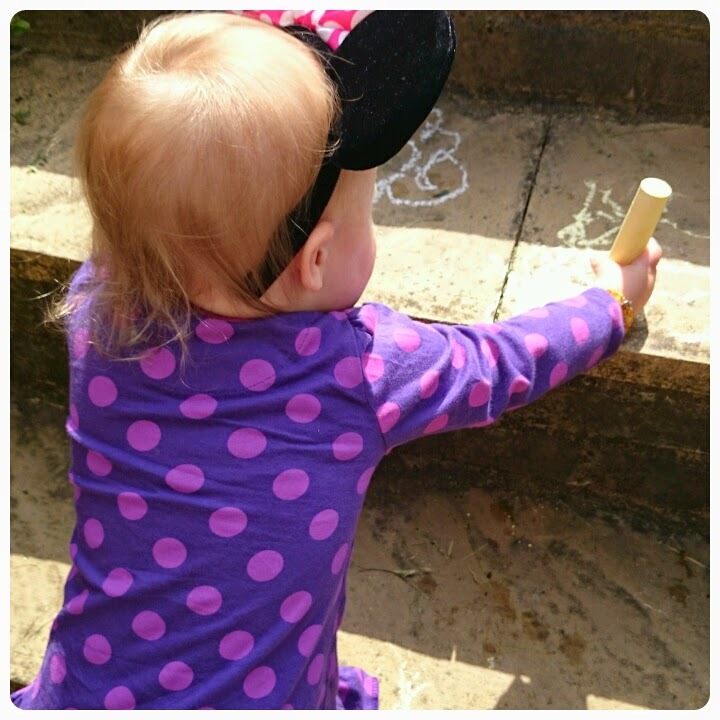 You may have noticed that we had some lovely sunny weather last weekend and or course you have to make the most of the sunshine, even if it is just sitting in your own back garden. 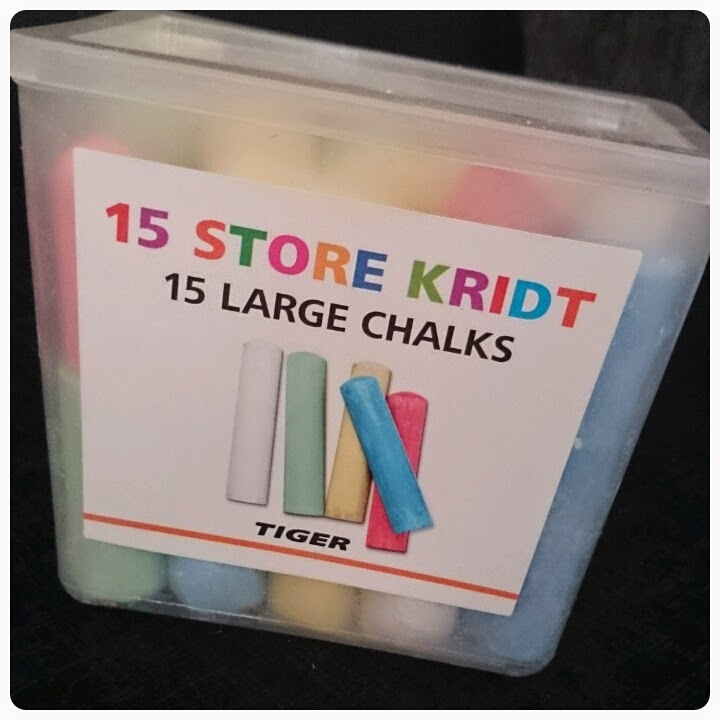 We recently took a trip over to Canterbury and whilst in our local Tiger Store, we purchased a box of 15 large chalks for a tiny £2. 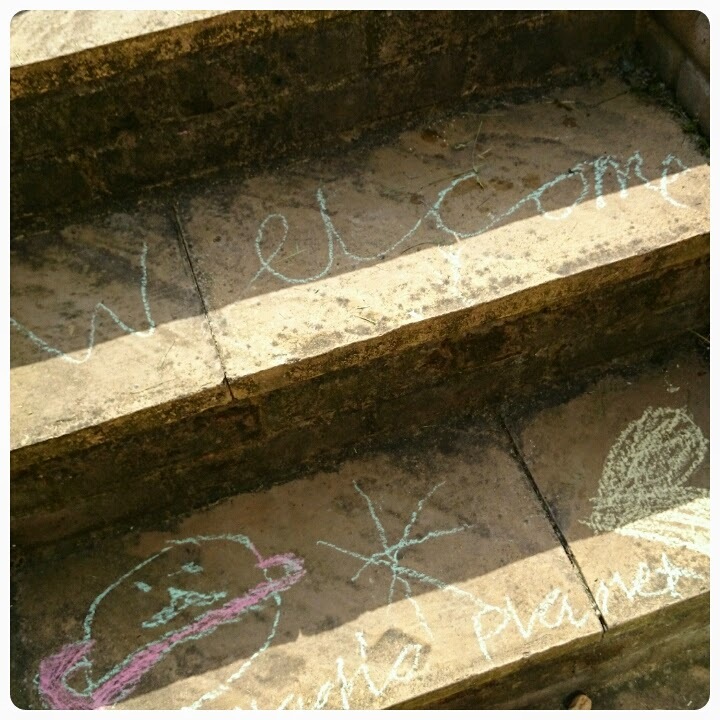 Our garden isn't very big but we thought these would be perfect for the girls to start getting artistic in the garden. red, blue, yellow, green and white. There was three of each colour so plenty there for the girls to share. It was nice to have an activity that the girls could all do regardless of their age and it of course meant that I could sit back and soak up the sun rays whilst watching them, bonus!!! 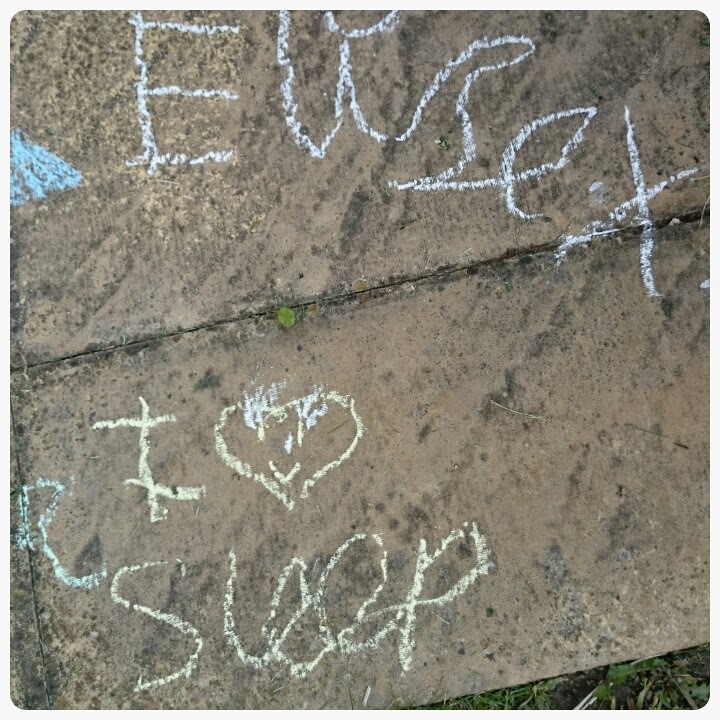 We did have to remind them a few times to stick to drawing on the patio and to not draw on the house. 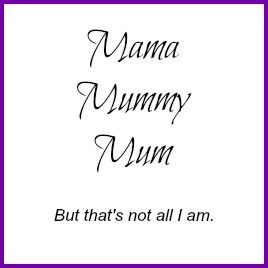 It gave the older two a chance to practice their writing. 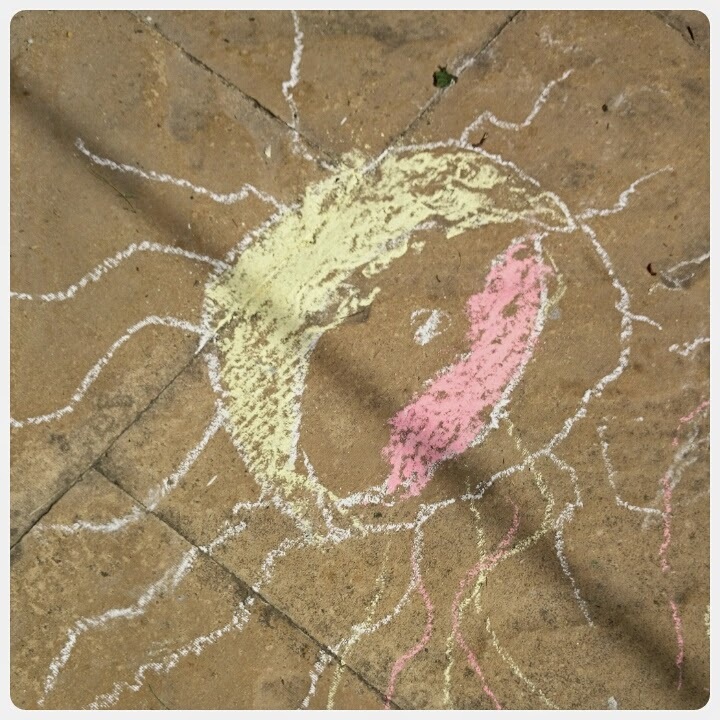 It also allowed all of the girls to really use their imaginations, creating some very unique art work. I think Gracie and Layla actually ended up with more over themselves than on the floor, so a bit of messy play added in too. 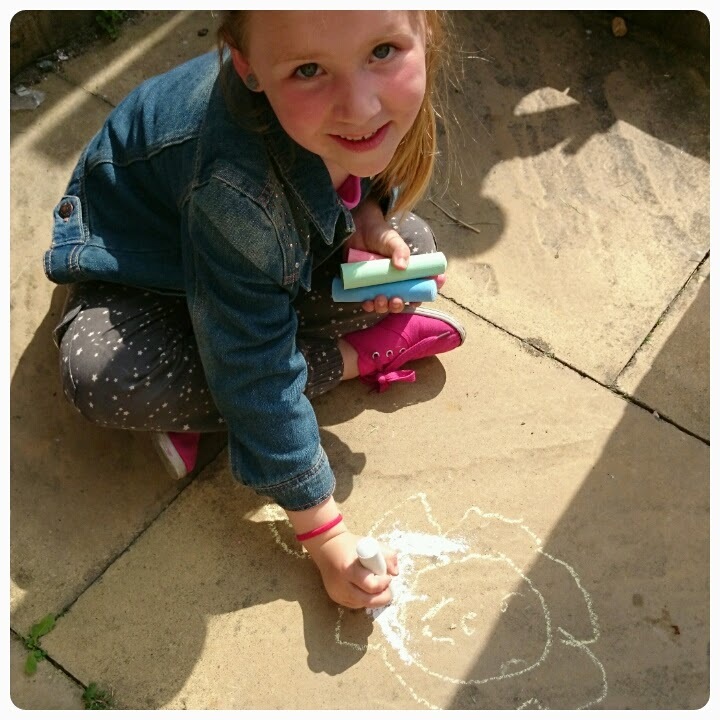 The great thing about these chalks is that they can easily be washed away with a bit of water, leaving a nice blank canvas for them to start creating their next masterpieces. 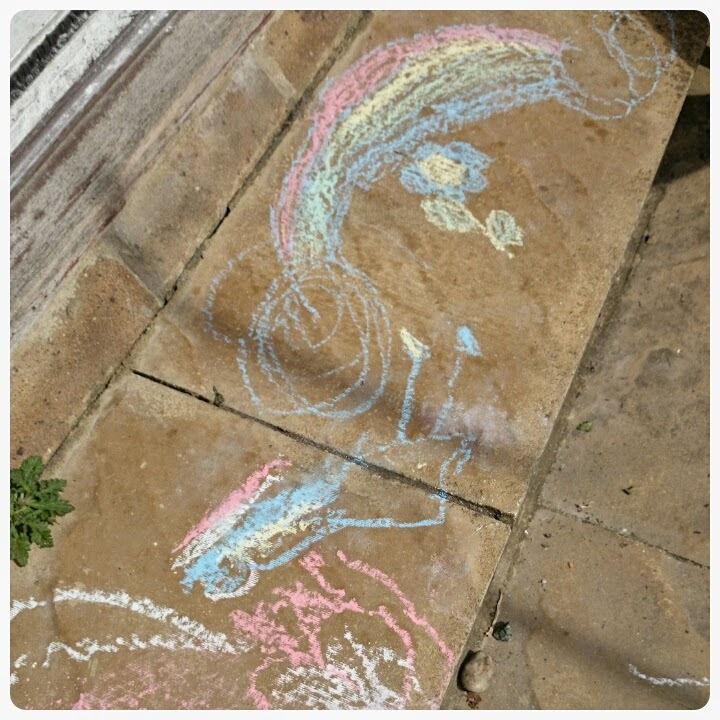 I lived with some artists in a house last year and we had a chalk wall drawing BBQ and drew pics all over the walled garden. We are all adults but was still great fun! What a great idea! 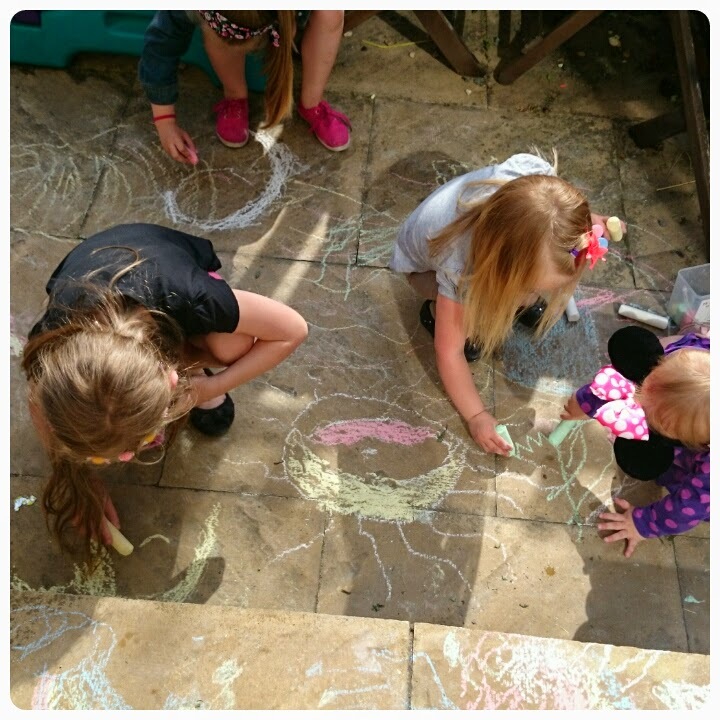 The girls look like they're having lots of fun :-) sadly our teeny garden is fully decked so I can't steal this idea! boo :( maybe paving ouside your house? This looks like a great activity .... I am going to get some chalk for my girls!! Just need it to stop raining! Love these. 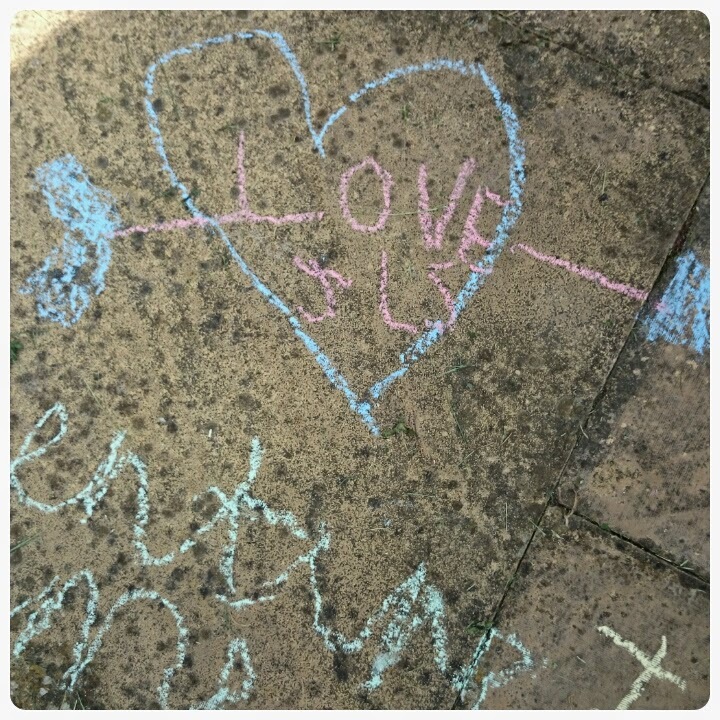 We have paving in our garden and I think the kids would love to have a little draw. 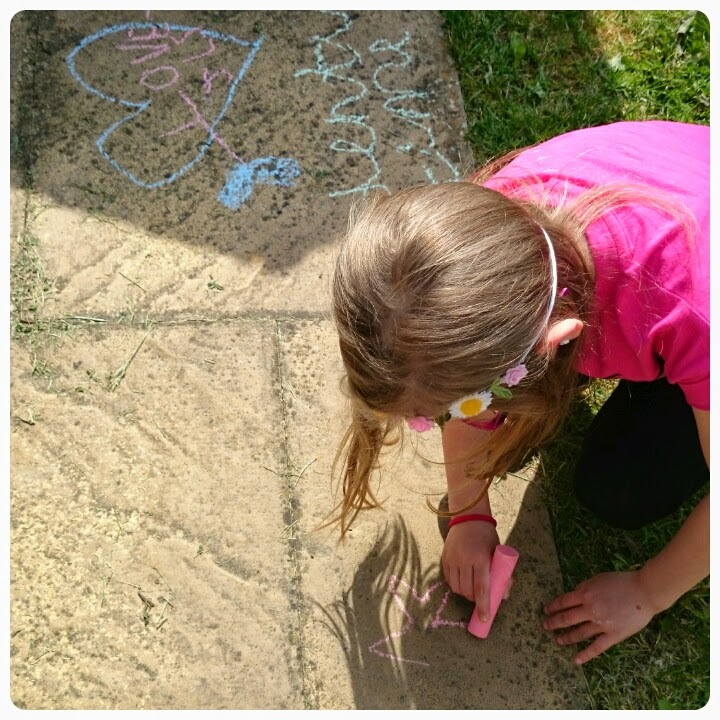 We love sidewalk chalk - it's such a great activity for all of them. Love seeing your girls all getting stuck in and enjoying it! 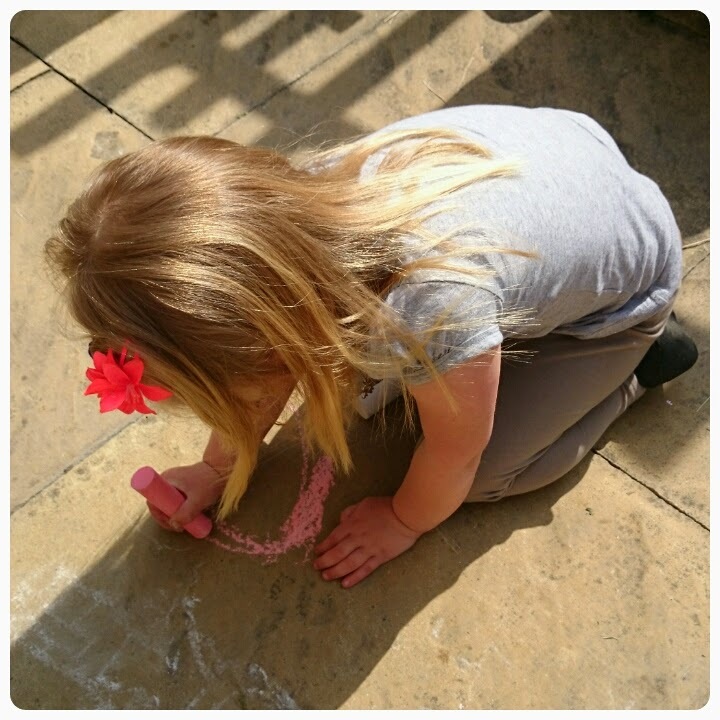 A great resource to allow their imaginations and creativity free reign, you could follow that with some great water play with spray bottles/buckets and brushes. 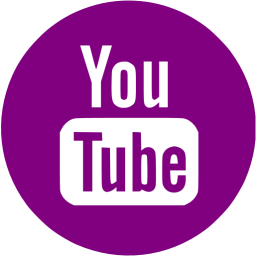 Thanks for linking up and sharing their fun with Country Kids. 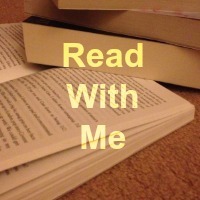 I love thatt idea, thank you!! 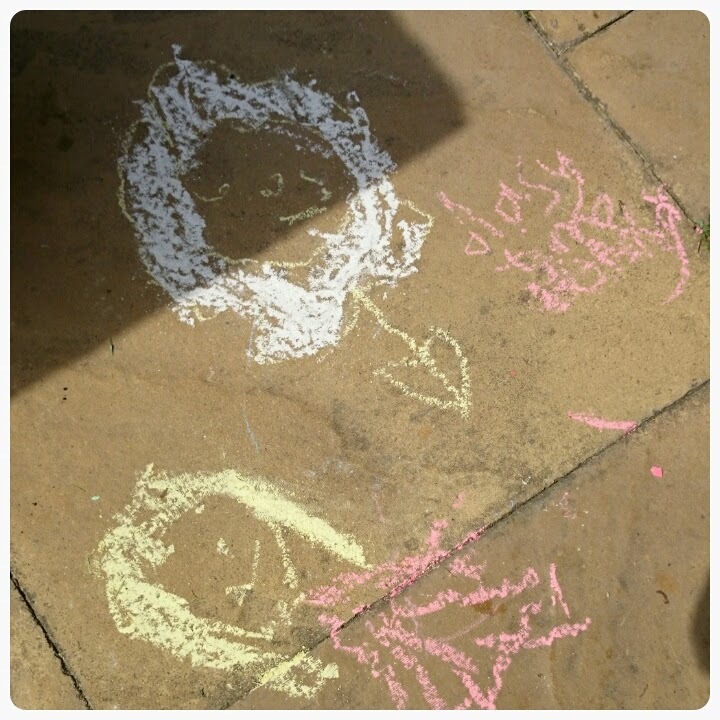 We love our outdoor chalks too. Always unleashes some creativity. I've seen this idea before and think it is a great one. 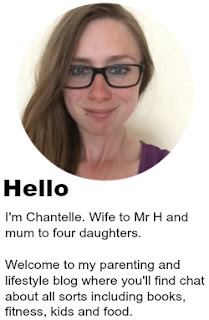 I look forward to my little one joining in when she is a bit older. Looks like your girls loved it.